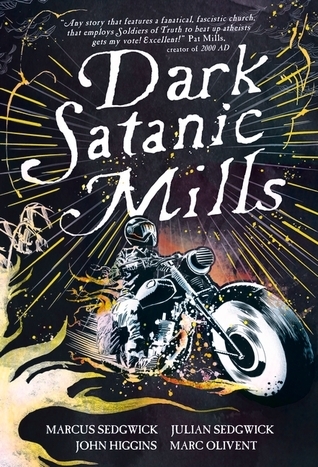 Set in a near-future Britain, Dark Satanic Mills tracks a young girl’s journey from the flooded landmarks of London to the vast, scorched and abandoned hills of the north. Framed for a murder she did not commit, the innocent and beautiful Christie has no other choice but to run for her life. Wow, this graphic novel was intense, but I shouldn’t have expected anything less with Marcus Sedgwick and John Higgins involved. It was deep and dark and full of questioning, and I loved every page. The story was fascinating, there is obviously something bad going on that the people in power are trying to cover up. I am not even fully aware that they know the full extent of what is happening to the world, why things are the way they are, but it’s obvious they want control and to get that they need people to believe they are best for the people. With a great deal of dystopian novels and stories like this there is a power divide and some people who don’t believe that those in power are acting for the benefit of the people as a whole and in Dark Satanic Mills we follow Christy, who is one of these people but at the start isn’t doing much about it, and Thomas who is trying to do something about it but is highly wanted because of his actions. The world in Dark Satanic Mills is horrendous but unfortunately isn’t that far out of grasp with our current world and the things discussed could genuinely happen which made it scarier. I love graphic novels because the pictures tell as much of the story as the words do and in this case even more son. The landscape and the way people were was all heavily described through the imagery and it was beautiful imagery. Things in the text skipped a bit and I did have to go back and look more closely at the pictures to understand a couple of things but I really did love it. The characters had their own style and the way they were drawn mimicked their attitudes brilliantly, Christy especially as she looked hard but with a soft edge to her and that was exactly how the character was once you go to know her. I sometimes think that I rush through graphic novels too fast and miss things and in this case I probably did. I loved the social political aspect of the book but I didn’t get the romance so much, maybe I missed the subtle elements of Thomas and Christy getting closer but it seemed like it was just suddenly there and I wasn’t keen on it. Obviously that is one draw back of the form in that things can appear to happen too quickly as there are only a set number of frames on a page but other than that one element Dark Satanic Mills was fantastic. The references to Blake and his poetry were all incredible and I loved how well it fitted with what was happening in the literary universe. The authors notes at the end of the book made me laugh and resonated with me at the same time because of all the poems read to me as a child I only remember two; the Jumblies and The Tyger by William Blake. I also really loved the references to Wizard of Oz and how well that fit in with Christy, she was so far from home, the things she knew and nothing made sense to her anymore so she was Dorothy for sure. I would definitely recommend this book to any lover of graphic novels. If you are new to them then perhaps try it but remember that there are significant differences to reading them compared to novels and you have to take every little thing in. Dark Satanic Mills will be published on November 7th by Walker Children’s Books. My copy was sent to me from the publisher in exchange for an honest review. Thanks for your review! My son loves graphic novels and your review has persuaded me to buy this for him for Christmas. I’m sure he’ll enjoy it. I also live in the North West, not too far from Preston!